You are here: Home > Are the Frackers Fracked? Apart from fierce opposition to fracking, gas companies are reeling from the ANC’s latest actions. As of 5 March 2014, things took an unexpected turn for oil and gas companies in South Africa – notably the would-be frackers of the Karoo. On that day the ANC suddenly unveiled its intentions to take up to 100% of new Oil and Gas ventures in South Africa, taken the big oil majors completely by surprise. The turnaround started in the late afternoon during discussions on amendments to the Mineral and Petroleum Resources Development Act (MPRDA) in Parliament’s mineral resources portfolio committee meeting. The very next day the Portfolio Committee rammed the new amendments through. Oil and gas companies like Shell had already expressed their unhappiness with the ANC’s previously stated intention to have a 20% carried interest in all exploration and exploitation of oil and gas in the country, plus the right to acquire an additional 30% of the venture. Now it seemed the Government could take up to 80% at “an agreed price”, in addition to the free carry. Only President Jacob Zuma’s signature is needed to sign the controversial amendment into law. Analysts have called the move ‘catastrophic’. Companies like Shell and Anadarko have publically voiced concern, and the latter has suspended exploration pending more clarity. Jonathan Deal of Treasure the Karoo Action Group. All this came scant weeks after the Petroleum Agency of South Africa (PASA, which regulates the country’s new oil and gas ventures) announced that it was lowering its estimate of the Karoo Basin’s shale gas potential to 40 trillion cubic feet (tcf). It was a staggering drop down from the 485 tcf that the US Energy Information Administration floated as a possible figure a few years ago. David van der Spuy, PASA resource development manager, told the Parliament’s energy committee that 40tcf was “our best estimate”. 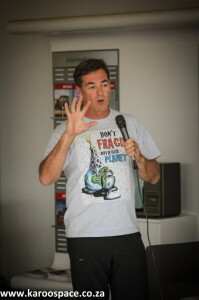 “Shale gas estimates are extremely uncertain at this stage,” confirmed South African geohydrologist Dr Chris Hartnady. “But PASA has long been sceptical of the EIA’s massive hype,” he added. In fact John Decker, principal geologist at PASA, was quoted in Mining Weekly in August 2013 mentioning an even lower figure of 30 tcf. But this is by no means the lowest estimate. Hartnady mentions that even pro-frackers like Michael Farina of General Electric are using estimates of 21tcf for the Karoo’s shale. “And I think he is being wildly optimistic,” added Hartnady. PASA’s revised estimates constitute “extremely interesting confirmation of the impact of doleritic intrusions on the available amount of shale gas in the Karoo,” says Dr David Fig, a Fellow of the Transnational Institute in Amsterdam and a research associate of the Environmental Evaluation Unit at the University of Cape Town. 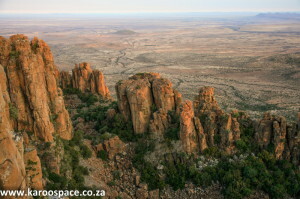 The dolerite pillars of the Valley of Desolation, north of Graaff-Reinet in the Karoo. Dolerite, also known as ironstone, was magma that rose steadily from deep underground 183 million years ago. Many noted geologists think it likely that the molten rock would have contributed to the degassing of the Karoo Basin. After years of talking up the Karoo’s shale gas reserves, Shell seems to be rather pessimistic all of a sudden. On 11 March they said there there was no certainty that fracking for shale gas would be financially viable. On 30 March City Press carried a report quoting Eggink saying that given the costs of building pipelines and importing water into the dry Karoo, Shell or its competitors would need to find 20tcf of recoverable gas within an area of 40 square kilometres to make the extraction viable. By June 2014, Shell and the other companies were still waiting for clarity, and in the case of shale gas, for exploration licences. 5 Responses to Are the Frackers Fracked? This is great news for the anti fracking campaign—thanks for your research. Intriguing developments while I’ve been away in the Kalahari! Thanks for the update, Julienne. On the economic front for the country, what is deeply disturbing is the apparent lack of understanding of the effect of the proposed legislation on investment in South Africa, which is desperately needed for the country to address the gaping and ever widening divide between the haves and have nots in the country. As usual in my view, it appears that the decision making process behind the legislation is not a consideration of what is in the best interests of all South Africans, but the consideration of how best the ANC can cling to power and keep their collective snouts in the trough. On the fracking front, it is good news. Fracking here is not in the best interests of all South Africans. Ho! Ho! Talk about an “own goal” … well done Julienne and Chris for digging this one up. It’s made my day! 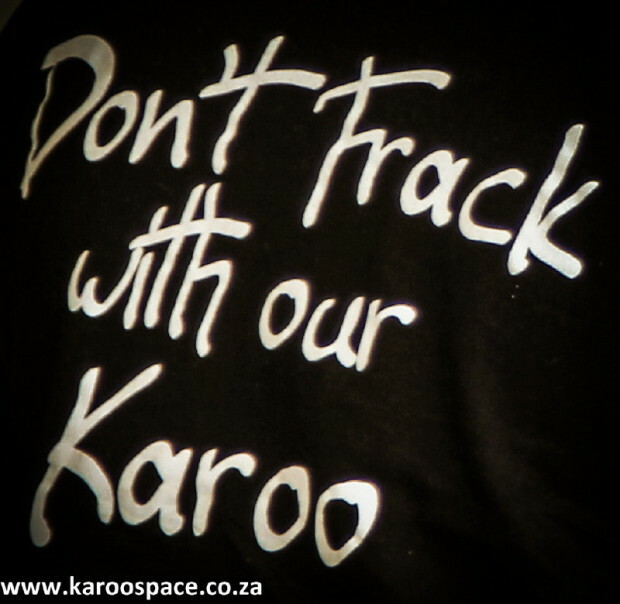 Although these are all good signs for the unfracked-Karoo community, its important not to think this a deal-breaker. Remember the moratorium where many thought it spelled the end of fracking? It just gave them time to come back with more ammunition, more greased palms, and more companies bidding for fracking concessions. 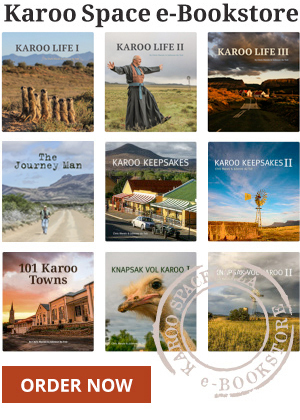 Its going to require a concerted, long-term effort to keep fracking out of our beautiful karoo.